Domain Name System (DNS) makes it possible to refer to Internet Protocol (IP) based systems (hosts) by human-friendly names (domain names). Name Resolution is the act of determining the IP address (or addresses) of a given host name. Domain names can be logical and easily remembered. Should the IP address for a host change, the domain name can still resolve transparently to the user or application. Domain names are separated by dots, with the topmost element on the right. Eg: www.yahoo.com . IP addresses have topmost element on the left. Each element may be up to 63 characters long. The entire name may be atmost 255 characters long. The right most element in a domain name is called the Top-Level Domain (TLD). Referring the above example (www.yahoo.com), TLD is 'com'. If a domain name is not shortened, it is called the Fully Qualified Domain Name (FQDN). For example, briefcase.yahoo.com can be specified by a machine in the yahoo.com domain as either briefcase.yahoo.com (FQDN) or as briefcase. Host names map to IP addresses in a many-to-many relationship. A host name may have one or more IP addresses. Conversely, an IP address may have multiple host names associated with it. Hosts that are designed to perform email routing are known as mail exchangers. These machines should have special purpose records in DNS called Mail eXchanger (MX) records. When a SMTP server or mail server, needs to send mail to a remote domain, it does a DNS lookup for the Mail Exchanger (MX) of that remote domain. A domain can and should have multiple mail exchangers. Mail that cannot be sent to one mail exchanger, can instead be delivered to an alternative server, thus providing failsafe redundancy. 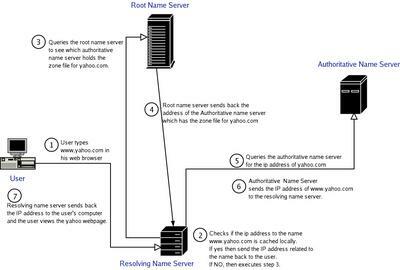 Root Name server - Each top level domain (such as in,edu,com etc) has one or more root name servers which are responsible for determining where the individual records are held. These servers are fairly static and every machine on the internet has the capability of reaching any of them. A root name server is allocated like just one to three per country. For example, India has only 2 root name servers. 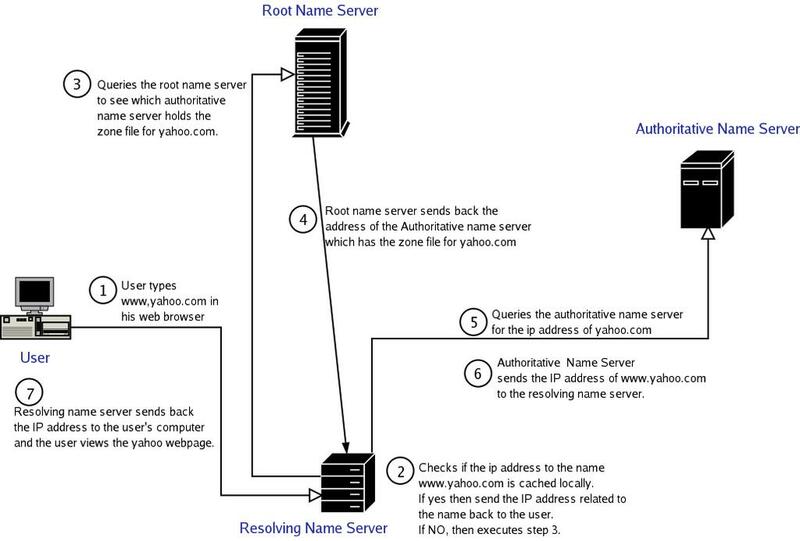 Authoritative Name Servers - These are the servers that the Root name servers send queries to. These servers hold the actual information on an individual domain. This information is stored in a file called a zone file. Zone files are updated versions of the original HOSTS.TXT file. Resolving Name Server - These are the servers that do most of the work when you are trying to get to a machine with a certain host name. Besides being responsible for looking up data, they also temporarily store the data for host names that they have searched out in a cache, which allows them to speed up the resolution for host names that are frequently visited. Zone File - It is used to map host names to address, to identify the mail servers, and to provide other domain information. Reverse Zone File - This file is responsible for mapping IP address to host names, which is exactly the opposite of what the zone file does. Note: The zone file and the reverse zone file has to be maintained by the user. Master Name Server - Also called primary server. This contains the master copy of data for a zone. Slave Name Server - Also known as secondary server. This provides a backup to the master name server. All slave servers maintain synchronization with their master name server. A zone may have multiple slave servers. But there will be only one master name server per zone. Fig: Step - by - step details of domain name resolution. author has a great insight... easy to understand write-up. Good job Ravi. Keep it up. Nothing mentioned about the way or method to determine a systems domain.